We are approved by the Kansas Insurance Department as a continuing education provider (Provider ID# 3102). Once you complete one of our online courses, we will report your course completion directly to the state through SBS for you. 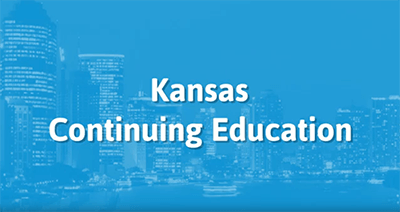 Most Kansas insurance producers must complete 12 hours of Continuing Education every 2 years. Of the 12 total hours, 1 hour must be approved in the category of insurance Ethics. This course provides all 12 hours of CE that you need! This course will review key concepts and principles of Life & Health insurance. It includes your Ethics requirement as well. This course provides all 12 hours of CE that you need! This course will review key concepts and principles of Property and Casualty insurance. It includes your Ethics requirement as well. This 4 Hour course will meet your one time Certification Requirements to start selling Life Insurance Annuities in the state of Kansas. This 4 hour class is approved by the State of Kansas. It meets the mandatory education requirement to start selling Long Term Care Insurance. This course provides the 3 hours of Ethics CE! This course will review key concepts and principles of insurance Ethics. This course applies to producers who need to renew their Long-Term Care Certification to continue selling LTC Insurance. This course will review key principles and concepts related to long-term care insurance policies.